I only have one problem with ukuleles and that is once you pick one up you can’t put it down. They are so little, light, undemanding and sweet. All you want to do is play with them. It’s almost like getting a puppy [maybe that’s why the tuning is described as “my dog has fleas”]. 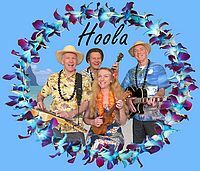 When we first formed Hoola the line up was Graham on steel guitar, Peter Moloney on bass guitar, Azzo Bell on ukulele and I played guitar. When Azzo moved up north, in those days it wasn’t easy to find a ukulele player. So that became my job and we hired in different guitarists when gigs came in. It quickly became an obsession and ten years later I still can’t put it down. Being a perfect instrument to accompany one self, the ukulele first became popular when introduced at the Panama-Pacific Expo in 1915. The two big hits from that expo were “On the Beach at Wai-ki-ki” and “Aloha Oe”. These songs sent America on a uku-le-le frenzy. It was so popular that all the sheet music in those days was adorned with ukulele chord diagrams. Since then there have been waves of popularity, the latest one being now, with Sydney supporting four clubs at the present time. Graham and I play as the B.U.K. House Band [Balmain Ukulele Klub] meeting on the teen Monday of each month at the Gladstone Park Bowling Club, Balmain. Each month the club grows in numbers sometimes having up to 70 ukers strumming away at the same time. Can be damaging to the senses! Nevertheless we all have a really nice time, visit ukuleleclub.net for some more information.